Nebula 3D offers colour deviation reports by comparing actual scanned parts and cad models. 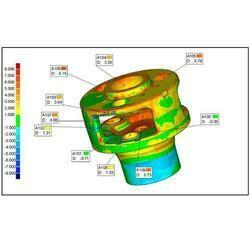 With the help of 3D Scanner and Reverse Engineering software, we offering our clients CAD to Part Comparison Services. In this, we scan the part with the point cloud data or polygon data is superimposed on the existing CAD model to understand the deviations of parts from the design. These are extremely quick and accurate method to check 3D complex parts, during part / tool qualification stage. It also helps validate 3D models that are created during the reverse engineering process. Virtual Sectional Cuts thickness report.